It’s curious how things can click together. Round 19 of 20 in 2018 MXGP allowed Jeffrey Herlings to make a massive home crowd raucous in celebration—it was only the fourth time this century a rider has won the premier class title on native turf. The event also showed what a vibrant stage the TT Circuit Assen can be. This fourth Grand Prix in a row at the venue was, in effect, a last bow before the 2019 Motocross of Nations. In three weeks, the Dutch team—one of the strongest threats to Team USA—could contemplate another packed Assen in just over 12 months’ time with the 1-2-3 number plates. Clearly, it’s a good time to be an “orange” motocross fan. 1. The suffering is over. Or is it? Jeffrey Herlings finally plunged the #84 up to the hilt. His seventh Grand Prix win in a row and 14 moto victories took his numbers up to 16 from 18 and 31 from 36 contested in 2018, and he has still only dropped 17 points all year (besides missing one race with injury). The recently-turned-24-year-old kept his usual low-key presence through the weekend, but did a remarkable job of passing off his date with destiny as “just another race.” Already a three-time world champion, Herlings talked about rising on Sunday morning and being able to visualize the amount of hours and work that had brought him to within touching distance of the MXGP gong in just his second 450 season and arguably (depending on what you view as blue ribbon) Holland’s first premier class crown since John Van der Berk won the 250cc championship in 1988. The result was rarely in doubt. Herlings was fastest through the shallow sand, earned his 12th qualification heat victory on Saturday, and disappeared with the first moto. The gap at the finish line showed a 38-second margin, but he’d cruised for most of the final circulation. His overtaking move on the second lap to pass Antonio Cairoli alongside the packed stadium section that oversees the famous chicane of the road racing course instigated a roar unheard or unseen in Grand Prix for quite some time. It was another sand masterclass where conviction in lines and attacking strength toward the bumps made the difference. He was mobbed at the finish after confirming his status, and Cairoli—who’d been the subject of the same acclaim in exactly the same spot in 2017—finished runner-up and went straight into the pack to congratulate his teammate. The Red Bull KTM team had time to prep the 450 SX-F (a second title in a row) and apply a #1—the first time the number has actually been seen in the premier class as Herlings proudly stuck it onto his front plate for the second moto. It did seem as though he was in a generous mood for the second dash. A holeshotting Glenn Coldenhoff (who was lucky to escape a crash in the first race, where he demonstrated the hazardous nature of Assen by plunging off the sand and straight into part of the concrete pit lane complex) was given extra room with a small spill that dumped the new champion down to the nether regions of the top ten. This was mere sport to Herlings. Cairoli—riding well and putting up a fight despite his spate of recent injuries—tried to pull away after passing Coldenhoff, but Herlings prowled like a predator through big game. He’s not done yet. In another quirk of fate, Herlings could frustrate Cairoli by beating his rival on Italian dirt at Imola in two weeks’ time, which will take his career tally up to 84. “The main goal is to get 101 GP wins, so that's 18 left to beat that record,” he openly admitted. Herlings talked of “eating all I want” that evening in Holland, having a “day off” on Monday, but then knuckling back to work on Tuesday to stretch his season out just a few more weeks and up to RedBud. “I feel that we are on a high level and we’ve been ‘at it’ for ten months, since the middle of November, so three more weeks is okay.” The last goal is Team Holland at the Nations, and maybe a face-off with Eli Tomac. Holidaymakers across Europe annually flock to Spain’s sandy beaches to lap up the sun and a sense of relaxation. 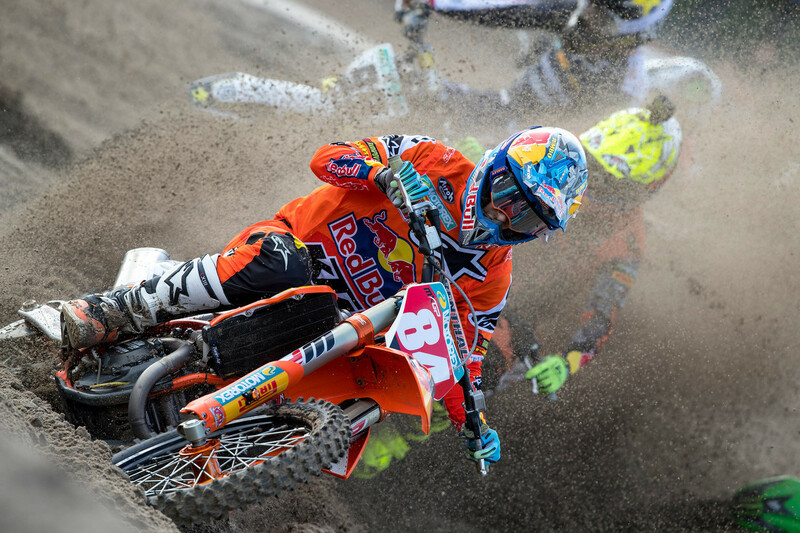 It seems that Red Bull KTM’s Jorge Prado prefers the Dutch kind. Under some pleasing Assen skies, the teenager registered back-to-back victories at the place where he gained a podium finish on his very first full Grand Prix appearance in 2016 (and won the 2015 EMX125 European Championship). “I’ve always done quite well here and have always been on the podium. I think the track just suits my style of riding and I had good starts, which meant I could enjoy myself,” he said. Displaying Herlings-eqsue levels of coolness, Prado barely faced a challenge all afternoon (or on Saturday). Eyes also turned to his teammate and world champion Pauls Jonass, who lacked training and preparation due to two damaged ligaments in his right knee and a period of inactivity since the accident that was caused by the collision with Prado in Turkey. “It is difficult to get into good shape… but it is so easy to lose it in just two weeks!” he lamented. Jonass’ feathers were also ruffled by the need for painkillers. A first-moto, first-turn fall cast him to the back of the pack, and although he rode admirably to eighth, there was a real chance that KTM would have a double celebration on their hands. He survived the second race in sixth place, but Prado needs to finish in just 16th place in the penultimate moto in Italy to make history as Spain’s first world champion in the principle FIM categories. 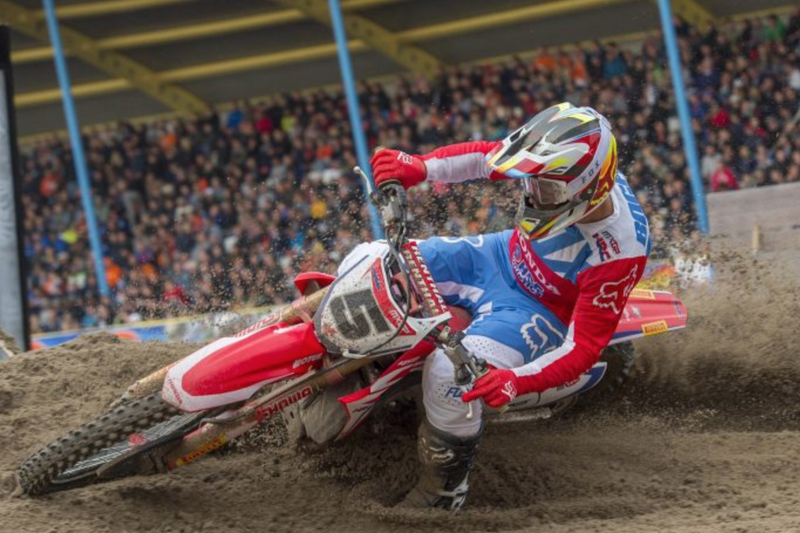 The TT Circuit Assen is a mecca for motorcycle racing fans and has staged a successful and slick round of MXGP for the last four years. The town/circuit has hosted FIM World Championship Grands Prix in road racing since the birth of the competition in the late forties and have rarely ceased in their passion and support for the sport. The motocross fixture is a spectacular as it is temporary. The famous chicane next to the wavy Geert Timmer grandstand was completely obscured by trucked-in sand, and for 2018, a couple of tweaks to make the track a little safer, little longer, and more accessible to the watching public hinted at how the promoters are getting the road racing-motocross mix correct. 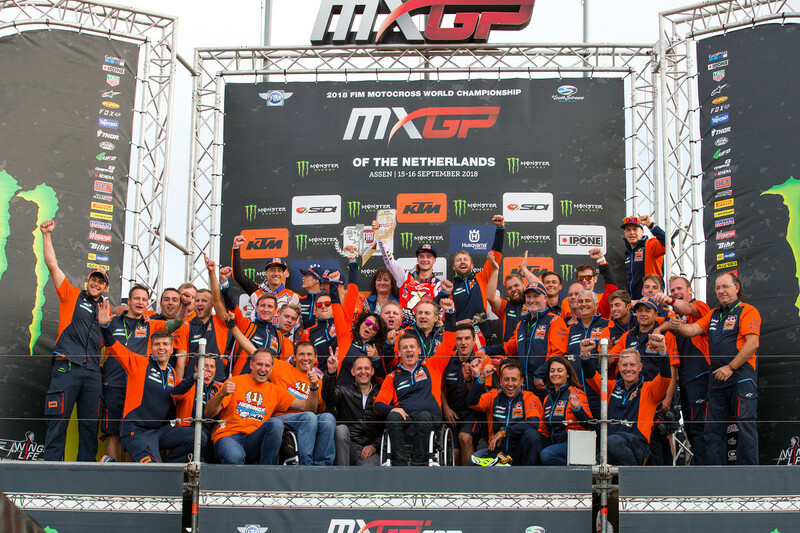 This weekend had the “Herlings championship factor,” but the cosmopolitan nature of the Nations and the prospect of the Dutch having a strong team for the 73rd edition of the MXoN means that Assen will be even busier and larger in scale and scope. This is a facility accustomed to motorsport events on a major scale and should be a fitting scene for the Nations and the first visit to the Netherlands since Lierop in 2004. There will still be question marks over the track. It could be longer, for example, and being scheduled a few weeks later in the calendar could produce some distinct autumn weather, meaning the imported sand will have to be well-packed to prevent some of the thinning and slippage that was noticeable in the 2016 edition of the Grand Prix. 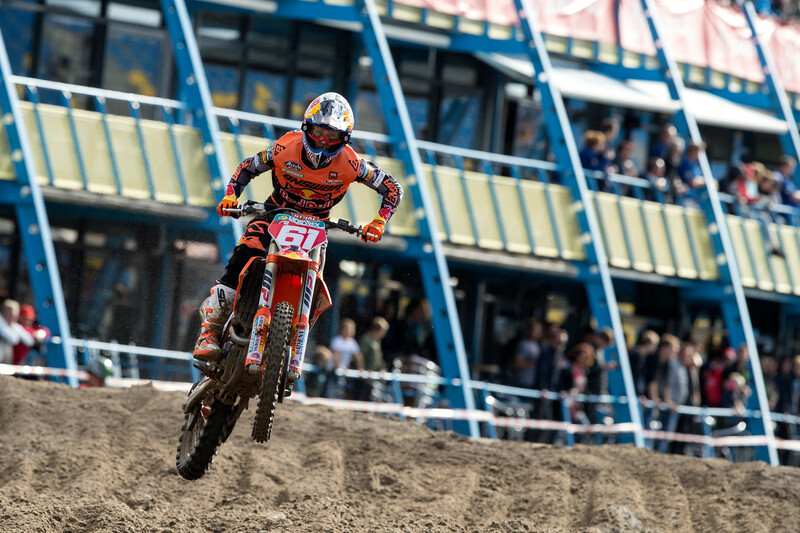 Overall, the buzz and atmosphere of Herlings’ “platform” was an exciting preview to the vibe visitors will be able to expect when the tournament has finished its transatlantic jaunt next month. Best to get hotel rooms booked now. Assen hasn't been kind to Honda this year. A few months ago, Marc Marquez won a riveting MotoGP race there, but a few weeks earlier, the Red Bull World Superbike team were reduced to spectators as both riders, Leon Camier and American Jake Gagne, were counted out of action. In MX2, Hunter Lawrence crashed in both motos to dump a potential podium spot, and Tim Gajser was denied a third consecutive MXGP top three appearance by a resilient Max Anstie. There were a couple of bright spots, however. Honda Motor Europe showed off the 2019 CRF range with five motorcycles, featuring two brand-new CRF250RX and CRF450RL models, and Redmoto Assomotor’s Mathys Boisrame was feted for his EMX250 Championship win, with the Frenchman conquering the last rung on the ladder before the vault into MX2. Crucially, the Grand Prix saw the competitive return of HRC’s Brian Bogers. The Dutchman has been out for over a year with a broken foot that required two operations, a false green light, more surgery, and then rumors surrounding the problem that even seemed to indicate his career was in jeopardy. Sixteenth place in the first moto gave Bogers his first MXGP points and capped off one of the hardest bad luck stories in the paddock this year. As Thomas Covington’s Grand Prix career/adventure swiftly winds to a conclusion (the MX2 phase, at least), it was interesting to see the Dutch Grand Prix become something of a summary of his experiences in Europe: disaster on Saturday when two incidents—one of which he was blameless—led to retirement from the qualification heat with a damaged bike, then a shock near-holeshot from the outside gate position followed by determination, no shortage of skill, and then a worthy podium rescue. It seems there has always been an element of adversity in the Rockstar Energy Husqvarna rider’s attempts to conquer this class, but he ends up acquitting himself rather well. An eighth trophy for 2018 represented the highest haul of silverware so far (beating 2017 by two and with one round still to go) in a single season. Covington would have had one more year in MX2 in 2019, and with riders like Jonass and Lawrence moving out the of the class, he may well have been Prado’s strongest threat. However, he faces a whole new challenge, back home in the U.S. next year, once the bags are packed after Imola in two weeks. 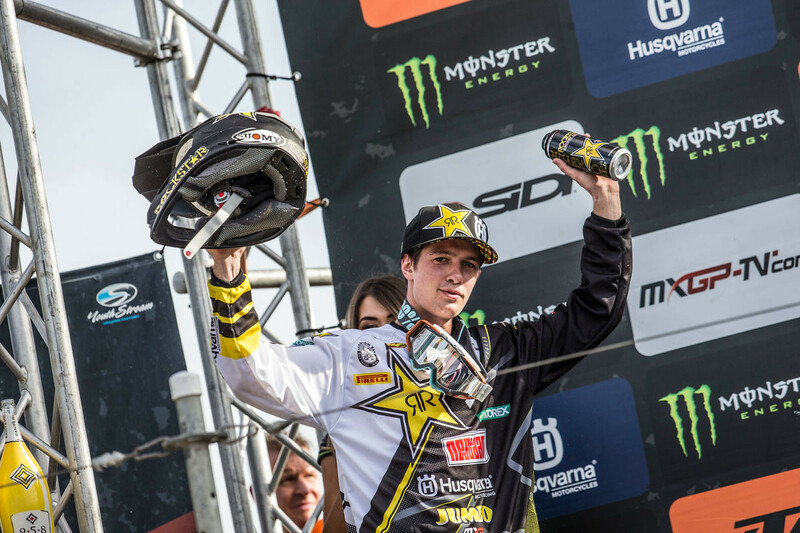 Max Anstie reminded those watching at Assen of his high technical ability and undoubted fitness. The Brit is one of just seven riders to make the MXGP podium in 2018, and although his season was blighted by a concussion and some underwhelming results in the wake of his finale to 2017 (only his first on the 450), it is unusual to note that the Rockstar Energy IceOne Husqvarna rider is one of only four athletes in the current MXGP top 20 without a firm deal or offer for 2019. Anstie has rarely found a settled team/package in Grand Prix since 2011. In two years at the Bike It Dixon DRT team (his longest stint with a squad), he had three different models of motorcycle. This year represented the first time he has used the same bike for two seasons in a row. Whatever the souring chemistry with the IceOne team, it doesn't look particularly creditable for the squad, who have also lost Gautier Paulin for 2019 and will have two new riders. There are rumors that Anstie could find space with the Hitachi ASA KTM team, but if this last shot doesn't work, then it means one of the series’ brighter racers is staring at a void.